England's Justin Rose remains on course to become world number one again as he heads into the final round of the Indonesian Masters in a tie for fourth. 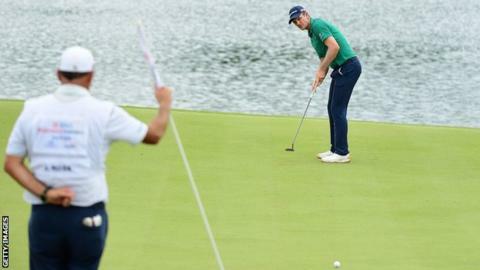 Rose needs a top-12 finish at Royale Jakarta Golf Club to overtake Brooks Koepka at the top of the rankings. The 38-year-old added to back-to-back rounds of 68 with a one-under-par 71 on Saturday after a birdie at the 18th. He sits seven shots off Thailand's Poom Saksansin, who leads by three strokes from Sweden's Henrik Stenson. Rose became world number one for the first time in September, becoming just the fourth Englishman to do so after Sir Nick Faldo, Lee Westwood and Luke Donald. The Olympic champion and 2013 US Open winner lost top spot to Dustin Johnson later that month and has since tussled with US Open and PGA Championship holder Koepka to be ranked as the world's best.